Ever since I saw Dave’s Fasting Disaster post I’ve wanted to add some fasting data to the Cholesterol Code reserves. Instead of fasting for two days as Dave had done, I wanted to fast for the three days he had originally planned for. In fact, why not do a full five days as outlined in the 10 1/2 day Feldman Protocol instructions? I had two advantages over Dave: 1) I’m much less lean than Dave is, which would likely make fasting easier. 2) I’ve done multiple multi-day fasts, making me a more advanced “faster”. Fasting is often described as a muscle that you need to train, which I’ve “flexed” a bit more than Dave has. The opportunity to get more data was too good to pass up. Especially since our data guru (and resident Lean Mass Hyper-responder), Craig, had already completed the full protocol not too long ago, leaving me as the last one out. I was plenty ready and willing to fix that. Several conversations with Megan Ramos at various conferences cemented the idea that when fasting, electrolytes are no joke. As such whenever I was feeling a bit “off” I would supplement electrolytes. I’ve been following a carnivorous diet since October of 2017, and thus in order to make the results comparable to my previous data sets, I wanted to keep diet relatively the same as well. Liquid forms of fat can sometimes mess with triglyceride levels (which can influence calculated LDL), so I decided to avoid them entirely. All of my fat would be found in the meat and cheese I was eating – no butter in my coffee, no chugging heavy cream (as I did during the Ketofest experiment), and definitely no MCT or coconut oil. What can go wrong, will go wrong… After I had already started the experiment, and right before my first blood test, I discovered that my local LabCorp wasn’t open on weekends. This entirely threw off my intended schedule, as one of the tests for the feasting portion would have landed on a Saturday. Not only that, but because they were only open on weekdays, this meant the 10 1/2 day protocol was essentially impossible. Unfortunately, there was no other local LabCorp nearby, so I was left with two options. Do the 6-day protocol instead. Extend my fasting phase to 7 days to push the Saturday test to Monday. Because the whole point of the experiment was to get fasting data from at least 5 days of fasting, I decided on option two. I decided I likely had enough body fat and experience to get me through 7 days of full-on fasting safely, and easily, and it would introduce a unique opportunity to get even more data. As per usual, I tracked all of my food from the high-calorie days (and all electrolytes/beverages during fasting days) through picture-taking. At the end of each day, I also logged all the food into My Fitness Pal. I ended up eating much more cheese and processed meat than expected, but still achieved my goal of at least 3000 calories for the 5 feasting days. First up is Total Cholesterol. Normal Baseline: usually around 320-350 mg/dL (not shown in the graph). After three days of fasting my Total Cholesterol was 345 mg/dL, where it stayed in about the same range until I switched over to the high calorie/high fat phase where it initially dropped to 219 mg/dL after three days, and then 209 mg/dL after 5 days of the high fat protocol. The correlation between my 3 day average of dietary fat was an astounding -0.9928~ even higher than the expected 87% inverse correlation. Normal Baseline: usually around 270-290 mg/dL (data not shown). After 3 days of fasting my LDL-C was 278 mg/dL which climbed to 310 mg/dL after 5 days of fasting. After 3 days of high calorie it quickly dropped to 166 mg/dL and after 5 days of high calorie dropped even further to 151 mg/dL. 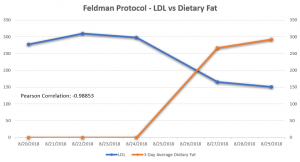 The inverse correlation between LDL-C and the 3 day average of dietary fat was, again, higher than expected at -0.988~ with the expectation being an inverse correlation of 90%. Normal Baseline: somewhere around 3000 nmol/L (not shown). After 3 days I was actually lower than my usual at 2890 nmol/L, however, this quickly skyrocketed to >3500 nmol/L after 5 and 7 days fasted. For those of you who were curious, if getting an NMR Lipoprofile, the test that measures LDL-P among other things, if you go above 3500 nmol/L it won’t give specifics after that. After 3 days of high fat/high calorie feeding it dropped down to 2086 nmol/L and then to 1578 nmol/L after 5 days of high fat/high calorie. Unfortunately, those numbers are estimated because of the LDL-P cutoff, each estimated “drop” assumes that LDL-P was at exactly 3500. Again, if we assume LDL-P was exactly 3500 nmol/L the correlation comes out to -0.91~ however, if we assume both topped out LDL-P are >3500 as a general guess, the correlation drops to -0.83~ which pretty closely matches the expected inverse correlation of 80%. (for those wondering, the best guess for now is it is genetic, but I’m not entirely sold on that as of yet). As predicted, HDL-C fell during the fasting days, from 43 mg/dL after 3 days of fasting to 37 mg/dL after 7 days of fasting. Biggest Increase: +9 mg/dL (8/24 to 8/29). Although this may not appear to be a lot of movement, HDL is one of the less noisy markers and tends to remain a bit more stable over shorter periods of time. The positive correlation to a 3 day average of dietary fat was slightly lower than the expected 70%, but came in close at 0.66~. 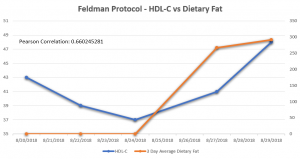 The positive correlation to dietary fat (with a 2 day gap) on this one was 0.84~ with no previous correlation on record, although Craig mentioned in his post the correlation was higher than his HDL-C as it is in mine. As expected, triglycerides went high during the early portions of the fast and then started to trend down the longer the fast went on. From 119 mg/dL at the 3 day mark, trending down throughout the fasting phase until it reached 94 mg/dL by day 7 of the fast. It continued to drop through the high calorie phase until it reached my lowest triglyceride level on record at 49 mg/dL. 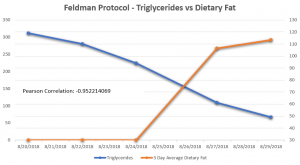 Although typically triglycerides are much noisier than usual, the correlation here was -0.95~ with 3 day average dietary fat, exceeding the expectation of a 61% inverse correlation. Normal Baseline: Usually around 112-140 nmol/L although it has been as high as 187 nmol/L, and as low as 82 nmol/L but neither of these occasions were normal baseline readings. I actually didn’t expect lipoprotein(a) to fluctuate that much, as with my past data the only things that have moved it so far is getting sick (causes an increase) and swapping meat sources (causes a drop). Generally it’s said in the literature that lipoprotein(a) levels are largely determined by genetic factors, although it does act as an acute phase reactant. As such I expected it fluctuate maybe 10 nmol/L as it usually does when I’m not explicitly trying to move it. But, of course, it had to surprise me by increasing above my normal baseline to 189 nmol/L by 5 days of fasting, then decreasing substantially to 77 nmol/L upon high fat re-feeding, and even further to 65 nmol/L after another 2 days – the lowest lipoprotein(a) readings I’ve ever gotten, leaving me technically “in range” of normal levels. The correlation with lipoprotein(a) and 3 day average of dietary fat was a pretty impressive -0.998~. There’s no previous correlation on record for Craig or Dave, so as far as I know, this hasn’t been replicated yet. It has been suggested by some who saw the result that fasting beforehand could have confounded the high fat feeding data. In addition to that possibility, I haven’t replicated the data myself yet, so I’ll definitely have to do a few more experiments to see if this reaction is consistent. For now, though, it certainly is unexpected – not to mention interesting – and it makes me glad I food/calorie matched for the blood draws I got late last year and early this year, while sick. During the wide spectrum testing days, I decided to check out a few additional markers beyond the “basics”. This included some thyroid markers, to see how they would change before and after the fast. I expected that T3 would be low, as lower T3 might be useful for muscle sparing and energy regulation, but I wasn’t sure what the other markers would look like. As expected, T3 went from so low it was out of range, to the lower end of normal (which still didn’t surprise me considering I’ve seen discussion that lower T3 on a ketogenic diet could be adaptive). Reverse T3 dropped by over half, and upon a little poking around it seems this is not unusual and may go hand in hand with the lower T3 as an adaptive change. In short, I would say that after full completion of the extended protocol, this experiment worked as a confirmation of the protocol’s effects in 1) a woman 2) who has a slightly higher estimated body fat percentage than Craig or Dave 3) who follows a predominantly carnivorous diet. Via the protocol, I successfully dropped my LDL-C by 159 mg/dL in a much shorter time period than would be conventionally assumed plausible. Additionally, I did this via diet changes only, with no changes to supplements (vitamin D, and magnesium glycinate) with the exception of an electrolyte supplement which was consumed on an ad libitum basis. Nor were there any changes to medications (none) during the experiment. Additionally, I found that the lipid system was far more dynamic for me personally than I had expected. 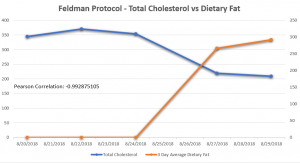 The previous time I had done the protocol I only dropped my cholesterol by about 50 mg/dL (6 day protocol with low-calorie instead of fasting), and I had thought that this attempt would yield a slightly higher drop. In fact, somewhat surprisingly, I nearly tripled the drop in cholesterol this time around. Additionally, unexpected lipid markers (such as lipoprotein(a)) showed a surprising amount of – what could turn out to be – dynamic response to diet as well. 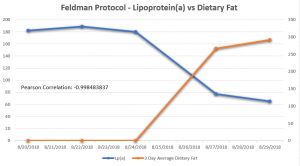 This will obviously require further follow-up to confirm it was the introduction of high amounts of dietary fat that resulted in personally historically low lipoprotein(a) but the initial results of this experiment are intriguing, to say the least. This really makes me question the validity of the cholesterol tests. How does one know they’re getting good data and seeing meaningful results from their nutrition? I regularly do 1-3 day fasts and time restricted feeding days. What’s the best way to get stable, actionable information from the NMR if following keto and fasting? My conclusion after reading some of the other posts on this was that one shouldn’t fast right before the test. Now I’m thinking maybe don’t fast 5-7 days prior is better? Wow, a 7 day fast is impressive! The most I’ve been able to achieve is 5 days. I usually start to feel cold on the second day and jittery at about day 3. I supplement with 400 mg magnesium glycinate, 198 mg potassium, and 2-4 g sea salt. Playing with those a bit doesn’t seem to help. I have plenty of extra energy stored, so I’m not a LM faster. I love the freedom and energy (when in the sweet spot) of fasting and want to get to a point that I can easily do five days at a time. Is there a post somewhere that describes your fasting protocol in detail, including supplements? I’d say it’s likely an issue if you’re multi-day fasting going into the test, but I haven’t seen issues with people time restricted eating even in the days prior. The general recommendation is to eat as you usually do (including timing), as much as you normally do (same macros, calories, etc), and what you normally do (eat your favorites/most frequent meals), and fast for 12-14 hours before the test. This helps to limit issues going in and should give you a pretty good idea as to how you’re doing. Not fasting for the 5 day lead-in is probably a good idea. The longest fast I did prior to this was 4 days, but it took me a year to even work up to that much. I definitely think it is a “muscle” or “skill” like any other that needs to be practiced for a lot of people. The biggest thing holding me back is just the boredom, but because this was wrapped around an experiment it wasn’t as boring. I don’t have a write up on what exactly I did (because I don’t want anyone replicating what I did as I am not an expert! ), but I took an electrolyte supplement (KetoChow fasting drops, because it didn’t have any sweeteners), magnesium glycinate (800 mg), and vitamin D (10,000 IU). 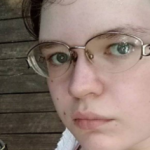 However – after reviewing my labwork, my electrolytes were definitely getting a bit wonky, so in the future I’d probably add sodium on top of that, and plenty of it. How long have you been fasting? Like I said before it took me a long time to work up to longer fasts, so perhaps it’s the same for you. Just be sure not to push yourself, and if you ever feel unwell I’d consider it wise to stop. I’ve been fasting off and on for five years. I started with Dr. Atkins fat fast and then I moved to water only fasts about three years ago. Thinking back, I did not feel cold when doing fat fasts. I have felt jittery with both types of fasts. I wasn’t as knowledgeable about electrolytes back in the fat fast days. I did fat fasts for five days when starting that. I’d have to go back and read his book again, but I think that’s what Dr. Atkins outlined. I started water only fasts at three days and worked up to five fairly quickly. Without really being able to resolve the cold and jittery feeling, I backed off on the longer fasts late last year. This year, I’ve only done 2-3 day fasts. I’ve been thinking recently that maybe I need to bump up the sodium significantly–maybe double. I might try upping the magnesium too. What is your reason for taking vitamin D during the fast? I assume that’s D3. If you’re fasting, how is that absorbed without fat? By the way, another thing I noticed while doing the longer fasts was pain in my joints and lower back. I talked to my doctor about this. We tested hsCRP, IL-6, and Uric Acid. My CRP is generally in upper 3’s, but sometimes as high as 5. Sadly, I’ve never been able to get CRP lower than a 2.8. IL-6 was 4.9. Uric Acid was at 8.2. Oddly, the CRP was at its lowest when Uric Acid was at its highest. Anyway, the pain and Uric Acid lab was another reason to back off on the longer fasts. Have you experienced anything like this while fasting? Wow you go girl!!! Well done. Hi Siobhan, I also have high Lp(a). I just started testing it this year and it was in the 200-300 range from May through July. I’m particularly concerned because both of my grandfathers died of heart disease. One was a dairy farmer and had heart problems all of this life and the other one smoked most of his life. My sister had her Lp(a) checked after I told her how high mine was and hers (like your sister) was much lower (30ish). All of my other markers are good (trig/HDL =<1, insulin<5, A1C < 5.3, low CRP, low PLAC). I also had a CAC score of 45. Interestingly, my ferritin is a little high (155) which according to your results seem to track with your LP(a). I've thought that red meat might be an issue but I don't have any homozygous genes for iron overload. Anyway, I'm getting some blood work done this week to see where I'm at now. I'm not keto but try to lean that way when I can. I'll let you know if anything changes and if I can move LP(a) as much as you have. Definitely interesting, especially regarding your sister. Generally when ferritin goes up, lp(a) also seems to follow alongside going off of my own data so far – regardless of whether I’ve been fasting or sick (cold, fever, etc). This could be because they’re both acute phase reactants. I haven’t really noticed any changes in my ferritin due to red meat intake so far (although I haven’t specifically looked). I think my “normal” ferritin is actually considered on the low side, for what that’s worth. But I would definitely be curious to see if you experience any changes – do report back if so! You may also find it helpful to read my article on lp(a) (if you haven’t already) as the story may be more complicated than it just being “bad”. It’s also worth noting that, regardless of what the marker is, I don’t especially like relying on one marker in isolation, lp(a) included. Well I wished I had results like your!! Just got my results back and I suspect coffee!! My LDL went from 5.42 to 5.70 my trig from 1.01 to 0.75 and my HDL from 1.65 to 1.96. Even my keto doc is freaking out over my high LDL… I am switching to carnivore and see who that goes… Will calculate my remnant. Remnant cool to HDL is 0.17 and AIP at -0.417. Oh I sure hope you guys are right about this. Yep, definitely a lean mass hyper-responder! Perhaps this page would be useful to your keto doctor? I hope you don’t mind questions like this….maybe someone else’s question too. I want to do the Feldman protocol. I have orders from my dr for routine blood work and asked for extra thyroid tests (while insurance was paying). I want to do the high calorie part of the test so the doctor will see the lower LDL… My questions is, will that mess up my thyroid results? Are thyroid numbers as fluid as cholesterol? All questions welcome (although I may not know the answers 😉 ). To be honest, I’m not sure. I don’t have a normal baseline for my own thyroid results (only fasting and high calorie so far). At the very least, if they come back as odd you could re-test on the basis that it was an odd circumstance, perhaps? I don’t generally recommend doing the protocol for your annual visit, just because it can mess up other results unknowingly which may be important for determining how you’re doing over all. This is really great work! Thanks so much for exploring this area and writing up your results in such details. It’s a very valuable contribution in a field that has been ossified with imaginary information for decades. It’s fascinating to see just how dynamic the lipid system can be. Just dipping my toe into Feldman protocol info here. How many callries and grams of fat were you consuming daily? During the “2-day gap” did you continue to eat high fat/high calorie? How important do you think the fast was to your results? I wish you had blood work done before the fast as an initial baseline to see if the fasting made any difference. How many calories and grams of fat were you consuming daily? To note though, if you wanted to try the protocol it doesn’t necessarily have to be this much, or that little. You can go higher, or lower depending on how much you can eat safely and comfortably so long as it’s high fat foods. The higher calorie you go, and the bigger the difference between the low calorie/fasting days generally the more of a drop you get. During the “2-day gap” did you continue to eat high fat/high calorie? Yes. 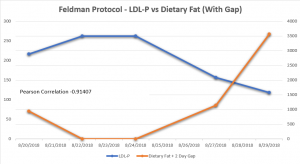 The “2-day gap” is what LDL-P trends from, but you still eat high fat/high calorie during that part of the protocol. If you look at my schedule graph (the blue one) you can see I was eating high fat/high calorie for 5 days (24th through 28th). 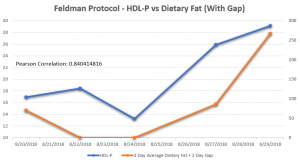 The LDL-C amounts reflected fat intake from 26th through 28th, the LDL-P reflects fat intake from 24th through 26th, but calories and fat were kept at a near constant through that time. How important do you think the fast was to your results? It helped to exaggerate the drop I think since fasting drives up LDL-C, and LDL-P in non-obese people, but I recently replicated the results with no fast before the high calorie ketogenic phase and with double the calories (about 4000-6000 calories per day) and still got an appreciable drop. The time before the high calorie for that one was baseline calories. Next time I do a longer version of the protocol I’ll get baseline bloodwork done, hopefully… it was mostly a budget concern. Hi Siobhan, Great data thanks for fasting for science! I was wondering if you would mind sharing the CBC data for 5 days fasted (particularly the absolute lymphocyte count) The youtube video skips over the 5 day CBC.. Also do you have a baseline lymphocyte count from your last normal blood draw before the experiment (or an average of your normal baseline)? The reason I am interested is that Valter Longo has seen a drop in lymphocyte count with fasting (or FMD) that reverses as the immune system regenerates after refeeding. He has some data to indicate that multiple rounds of this process ‘clear out’ autoimmune lymphocytes and help with autoimmune diseases. So not really out of range. I was drinking coffee, and diet drinks so not water only, so perhaps that makes a difference? I’ll do a truly water only fast some other time, so I could always check then. I’be been Keto for 5 months and after 3 months my triglycerides jumped from 151 to 170, TC from 293 to 354, HDL from 54 to 62. In this 3 month span I added coffee and mct oil daily and until well after noon each day. Could the coffee and the mct oil be a factor in my triglycerides increasing? I have removed the mct oil and will retake labs in a month. Any information would be greatly appreciated. It could very well be either or both – the HDL going up along with triglycerides definitely suggests that. Were you 12-14 hours fasted at the time of the blood draw? Yes I fasted for 12 hours before. What are your thoughts on sucralose sweetener? I flavor my coffee with that. As for sucralose I don’t really have any particular feeling about it. I consumed it every day pretty much for a different protocol I did and didn’t notice anything different, really. Some people can have adverse reactions to sweeteners but I think it’s fairly individual. It looks like the 3 day protocol and removing mct/coffee for 3 days prior seems to be a factor on results. It seems so at a glance – usually with coffee we prefer people come off of it for about 2 weeks (just from various attempts this seems to be how long it takes to see levels go down to normal if that’s what was causing it). I wonder if trigs would continue to go down if you stayed off coffee for another week and a half?